We’re almost halfway through NaBloPoMo! Shout-out to the two people who actually read my blog – you’re probably getting tired of seeing me pop up in your reader every day, so thanks for not unfollowing me. This gift was not handmade, but it was hand-designed. Sort of. And it wasn’t the best present I’ve ever received, but it was definitely one of the most memorable. What made it special, if you can call it that, was that it was totally and completely representative of the givers. The t-shirt achieved exactly the reaction they were looking for: it made me laugh and annoyed me at the same time. This summed up my relationship with all three brothers at that moment in our family’s history. 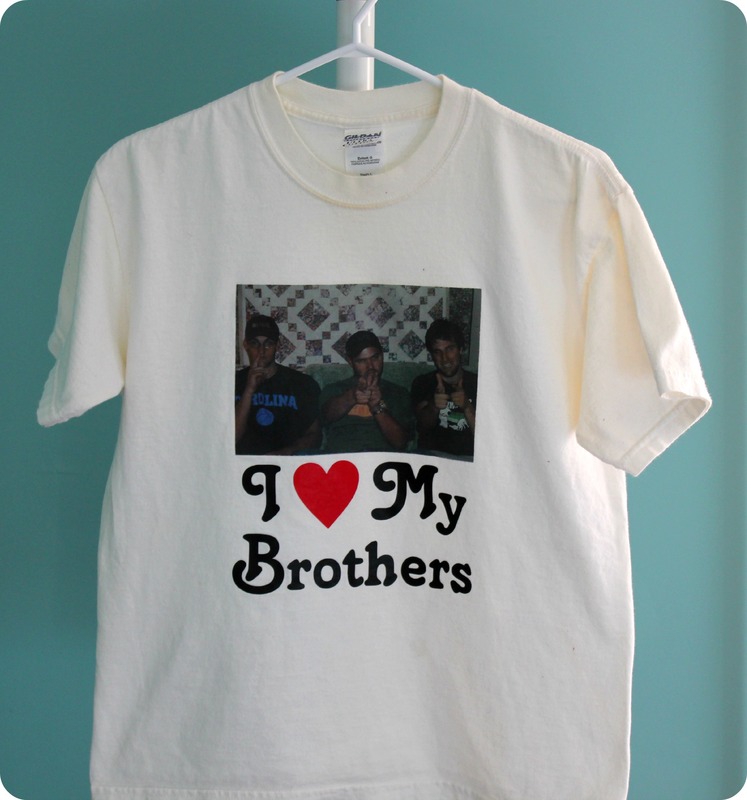 I thought the shirt was funny and appreciated the effort that went into making me laugh, but part of me was a little bit put out that the only gift from my siblings was all about them. At that stage in our lives, when we were 18, 20, 22 and 24, we got along, but I was an outsider. The three of them were best friends, something that I now know is unusual, but at the time made me feel left out. We shared jokes and liked each other’s company; it was just that we had different interests. We ran in different circles. After any family get-together, they would usually head out to the same party or the same show or to meet the same friends downtown, while I would head in my own direction to my own friends. Ten years later, things have changed. My oldest and youngest brothers are still close, though not as inseparable as they once were. After a falling-out and period of distance, my middle brother is now friendly with the other two, but I don’t think they will ever completely recover their closeness. And I’ve developed relationships with each of them separately, through shared experiences – parenthood, school, marriage, adulthood. The shirt lives in my closet. I’m not going to wear it, but I won’t get rid of it either. Maybe Bean will wear it one day to surprise his uncles. Or maybe I’ll just keep it to pull out occasionally and reminisce about times gone by.